Translation Tribulations: Your working software tools as Xbox "games" in Windows 10! 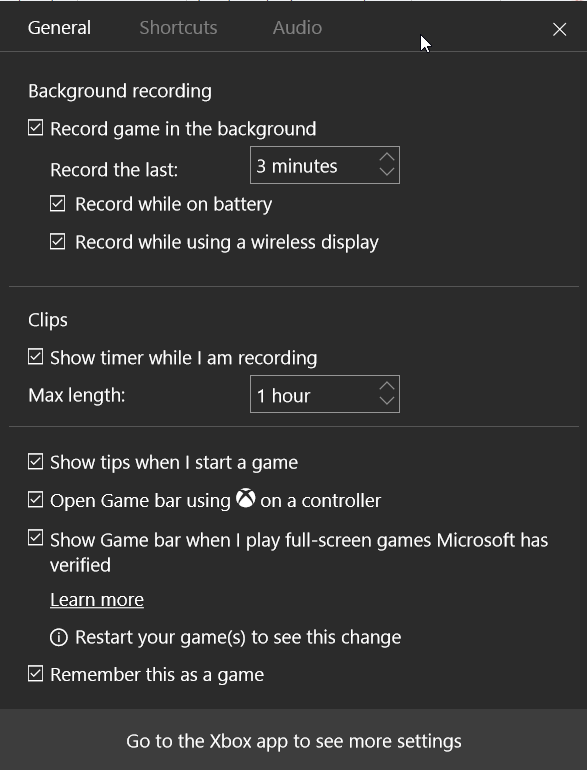 Your working software tools as Xbox "games" in Windows 10! For the last few days I have been away from the office, working from home on a relatively new laptop which doesn't have a lot of the software installed that I use on my main machine. Then today when I needed to make a screen recording to document a memory leak in one of my software tools, I was annoyed to realize that Camtasia wasn't installed on the laptop and I had to find some other means of video capture. That was when I found out about the nice little video recording tool included in a somewhat obscure way with the Windows 10 operating system. When invoked for the first time in an application, such as memoQ, the Windows Task Manager or anything else, you'll be asked if the program you are running is a game. Lie and click Yes, this is a game. Continuous recordings can be made for long periods of time, but the really cool feature of this recorder is that it can be set up to maintain a history of a defined period just passed and save this history as an MP4 video file. The default is 30 seconds; in the screenshot above, the backward recording buffer is set to three minutes. What good is this? Well, one thing you can do is record a retroactive video after the program you use crashes. This can then be submitted to support experts to help them figure out what went wrong, or you can review the recording yourself to see what was done. A very boring example of this is shown below; it shows the activity in the Windows Task Manager as I launch various applications. The results showed me the steady increase in memory consumption by the memoQ Web Search feature (amounting to over several gigabites after perhaps 20 minutes, leading to crashes and/or other problems) versus exactly the same search in 5 tabs of Internet Explorer using IntelliWebSearch. The latter is rock stable in its memory use, causing no problems at all and offering much greater flexibility, which is why I strongly recommend this search productivity tool, which can be accessed from any Windows application.